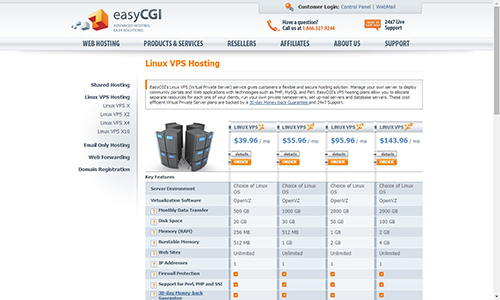 EasyCGI is a web hosting solution provider that addresses all your Windows-based web hosting issues. Everything your website needs to run efficiently and securely is provided in EasyCGI’s hosting plans. The name EasyCGI itself is a good indicator of what you should expect by way of working on your site – ease. On the front end, you will find that the EasyCGI Control Panel lets you monitor every part of your website and the server that is behind it. One-click installation of applications like WordPress and Weebly makes your life much easier. If you can handle it all by yourself, perfect. But if not, EasyCGI staff will help you with making sure you will have a site that you can truly be proud of in a matter of minutes; all it takes is one phone call. EasyCGI makes sure that its hosting plans are as accommodating as possible. For example, the hosting plans come with the option of having your site run on a Windows 2008 server or a on a Windows 2003 one. This is a plus, as you don’t have to be limited to just one choice. If you want, you can choose your web server to be either IIS 6 or IIS 7. Your ASP .NET version could be 1.1, 2.0 or 3.0 and you would still be able to host your site on EasyCGI. You can have PHP 4 or PHP 5. EasyCGI tries to make all possible applications and features available to you. EasyCGI, in partnership with CM4ALL, offers you one of the easiest website building tools ever and throws in hundreds of templates for free. Add all these together, and you are good to start making an amazing website. If you want to open an online store you will have the merchant account made available for you to work with. You can start accepting credit card payments within minutes. If you are a webmaster and are serious about your website, you will always appreciate any advertisement of your goods or services. Well, at EasyCGI you will be able to advertise your site on Google because you get a $100 Google AdWords bonus and a $50 marketing credit for use on Yahoo! or Bing search. In fact, you get to have your site submitted manually to all the relevant directories. 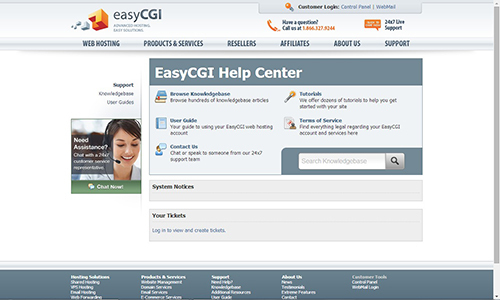 EasyCGI offers 24/7 support. The first thing you need to do when you have a problem is go through the knowledgebase in the EasyCGI Help Center. There, you will find hundreds of articles on everything from “Getting Started” to how to work on virtual private servers. If that doesn’t work, you can then go to the User Guide page and look at step-by-step instructions on how to do almost everything on your site. If you think that you need to be trained or want a refresher on how to work with your site, you can go to the tutorials page and go through the lessons one by one. If all else fails, then it is time to contact the support team. Here too, you have several options: you can email them, call, raise a ticket (and wait for fast response) or you can directly chat with the tech support. 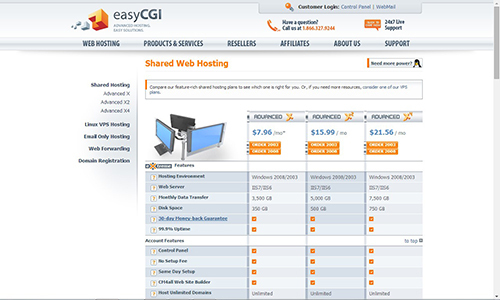 EasyCGI has three Windows Hosting Plans: Advanced X, Advanced X2, and Advanced X4. Advanced X costs $7.96 per month. The plan includes 3,500 GB of bandwidth, 50 MySQL databases and 350 GB of disk space. At $15.99 per month, Advanced X2 includes 5,000 GB of bandwidth, 50 MySQL databases and 500 GB of disk space. Finally, the Advanced X4 is priced at $21.56 and brings with it 7,500 GB bandwidth, an unlimited number of MySQL databases and 750 GB disk space. All of the hosting plans come with more features like unlimited number of FTP accounts and unlimited number of domains under one account. In case you need Microsoft SQL databases you will need to sign up for the Advanced X4 plan. Although it might look like it, EasyCGI isn’t only a Windows server hosting provider. If you have a Linux-based site, you can choose from three virtual private server options: Linux VPS X ($39.96 / month, 500 GB bandwidth and 20 GB disk space), Linux VPS X2 ($55.96 / month, 1000 GB bandwidth and 30 GB disk space), Linux X4 ($95.96 / month, 2000 GB bandwidth and 50 GB disk space) and Linux X10 ($143.96 / month, 2000 GB bandwidth and 100 GB disk space).